Il Vecchio was born in Bergamo, Italy, as Jacopo d’Antonio Negretti and also known as Jacopo Palma. He was from a family of Painters including his nephew Antonio Palma (1515 – 1574) and Antonio’s son Giacomo, called Palma Il Giovane (1548 – 1628). They were active mostly in Venice, and painted in the style of the Venetian School. Il Vecchio’s name in fact comes from the Italian word meaning Old, to distinguish him as ‘Old Palma’ from the younger Palma Il Giovane. It is said that he may have been a student of Titian (1485 – 1576) for a brief time, but may have just studied the Venetian master’s influential works. There is also noted mention of a possible apprenticeship with his fellow Bergamo painter, Andrea Previtali. He was known for his friendly rivalry with another Venetian artist, Lorenzo Lotto (1480 – 1556). He painted several subtly sensual and tender depictions of women with his soft Venetian colors, including his, A Blonde Woman, The Three Sisters, Judith, A Sibyl, and Portrait of a Young Woman. He painted his Venus in 1520, close in style to the Venetian master, Giorgione’s (1477 – 1510), Sleeping Venus. Il Vecchio’s piece, Violante, was one of several portraits he painted of who may have been his daughter Violante. His religious works adorn a number of Venetian churches, many of which were depictions of the Virgin and Child with Saints, or Sacra Conversazione. 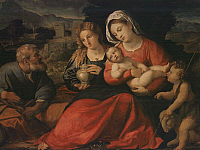 One example if this work, Holy Family with the Young Saint John and Mary Magdalen, now hangs in the Uffizi Gallery. His lasting influence is seen in his pupil, Bonifazio Veronese (1487 – 1553), who is said to have influenced the master Tintoretto (1518 – 1594).